Jiu-jitsu.News: Ukrainian fighter has become the absolute champion of Europe 2018! The major international jiu-jitsu event “Rome International Open IBJJF Jiu-Jitsu Championship 2018” took place in Rome last weekend. Ukrainian fighter from the SC “Borets” / ZR Team Ukraine Serhii Krasovskyi became the winner in the absolute category. The final fight became one of the most spectacular matches of the championship. Serhii managed to grind out a victory from more experienced, older and heavier opponent during the final seconds of the fight. 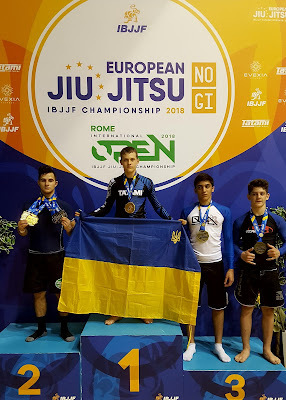 During the “Rome International Open IBJJF Jiu-Jitsu Championship 2018” young fighter showed high professional techniques and thirst for victory. “First of all Serhii has demonstrated the strength of spirit and proved that everything is possible for those who wholeheartedly believe in their victory!”, – summed up fighter`s coach, Ievgen Skyrda.